The night sky at Chaco Canyon has long provided a top star-gazing opportunity. Flares from oil and gas rigs threaten to dim the celestial brilliance. The stone walls of the Chaco Canyon great houses are marvels of ancient construction, rising several stories into the blue desert skies. While I was looking over the sites from the ground, Eco Flight was in the air. Chief pilot and founder, Bruce Gordon, recently wrote his Captain’s Log describing a “day with the ancients” on October 5. Eco Flight, which is based in Aspen, was doing more than sight-seeing. 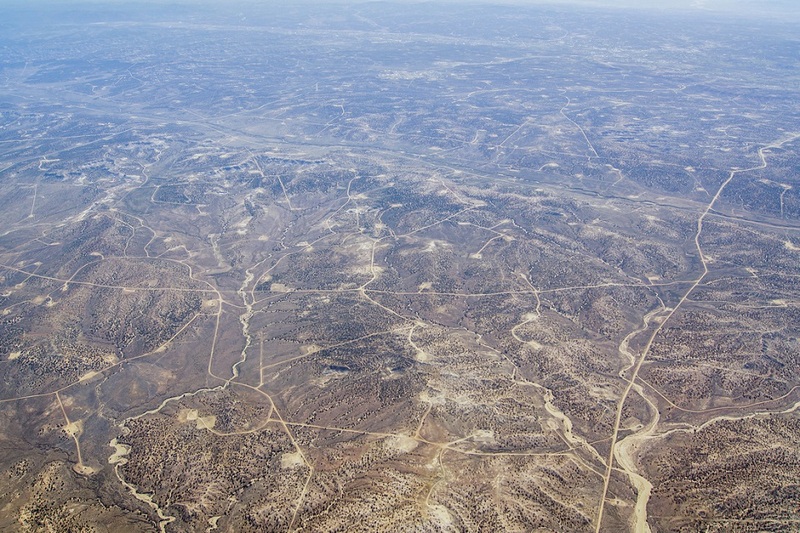 Its mission was observing drill rigs encroaching on Chaco, and it produced stunning images. “Following a road from the air 1,000 feet above ground level is something we used to do on a daily basis, especially before the advent and routine use of GPS. So when the archaeologist onboard said fly to the Twin Angel Great House and follow the Great North Road south, I thought ‘piece of cake,'” Gordon wrote. 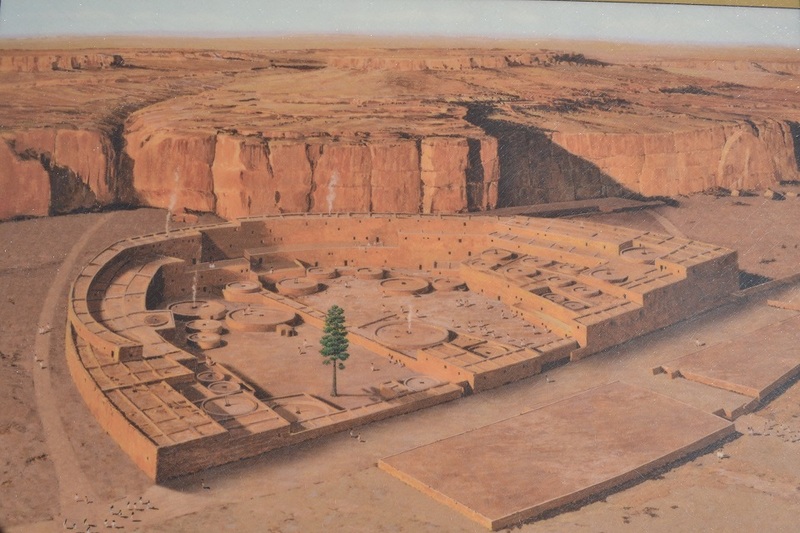 An artist's illustration shows the scope and scale of a Chacoan great house while this center for commerce and community was at its peak. “The Great North Road leads south down to Chaco Canyon and was the main ‘thoroughfare,’ not just for trading and a means to get to other Great Houses, like Pierre’s Complex (discovered in the 1970s) along the way, but was also thought to be an ancient Pueblo religious pathway leading to their place of origin and along which the spirits of the dead travel,” Gordon continued. “What our onboard archaeologist failed to point out to me was that the road was 30 feet wide, nearly 1,000 years old, and now lays in the midst of a spider web network of oil and gas exploratory well sites. Back to the good old GPS. “The Twin Angel Great House is one of the smaller of the Great Houses, with only 17 rooms (some had hundreds), and while a bit difficult to spot from the air, you can see how it was strategically located, and can imagine the similarities to the placing of Medieval castles. “The road goes due north on an unusually straight line given the year of ‘construction,’ over mesas and through washes where it ends up in Chaco. Seven other roads lead into and out of Chaco, like an ancient interstate system. 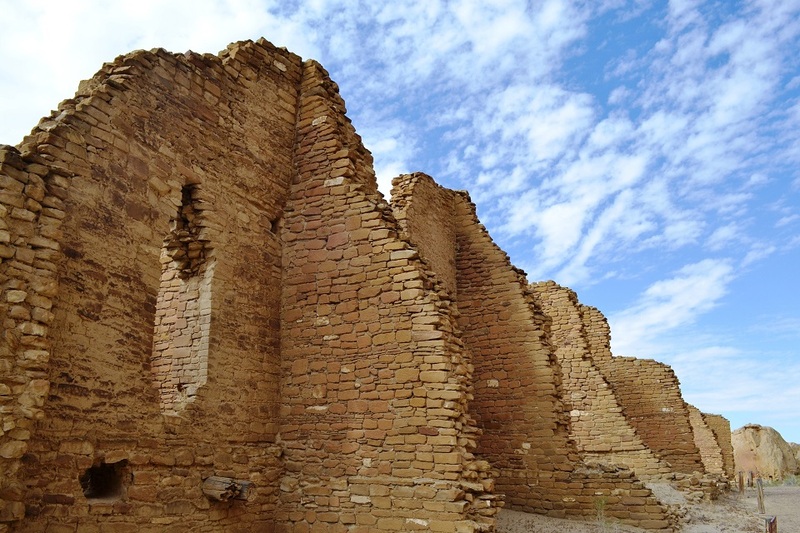 “And then there is Chaco itself, which in the early 1000s had become the ceremonial, administrative, and economic center of the San Juan Basin. “The Partnership for Responsible Business, an educational arm of the New Mexico Green Chamber of Commerce, sponsored our overflights to show the value of this special landscape to business owners, tribal leaders, and journalists. The flights were very compelling, and generated many news stories. Roads and drill pads mar the once empty mesas of New Mexico where only Chacoan roads crossed over a thousand years ago. “If you have the opportunity to travel to Chaco it is a goldmine of archaeological information. It is inspiring and timeless. One of the most unique aspects of this National Historical Park is that it is classified as an International Dark Sky Park due to the lack of lights, near and distant,” Gordon continued. “Our flight objective was to highlight New Mexico’s treasured landscapes as the BLM is set to make two major decisions this coming year on drilling on public lands. 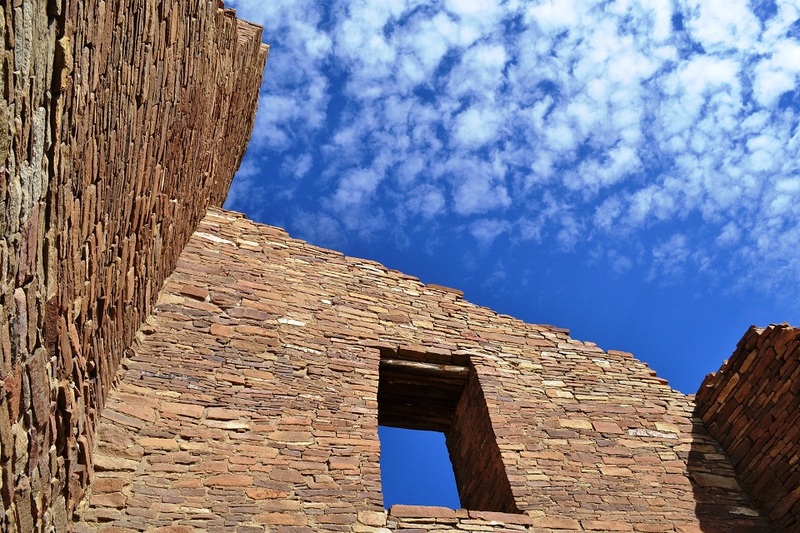 The first decision will be on where, when and how the drilling will occur in areas that include wildlife habitat, cultural artifacts and sites important to the Pueblos and Navajo. The second decision will be on flaring and venting, and the associated waste and pollution. 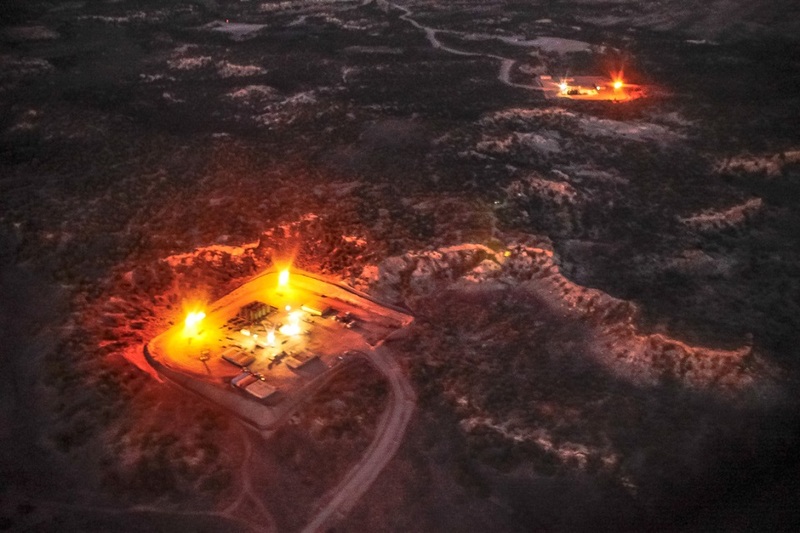 To literally illuminate these well sites that are flaring natural gas, we did a night flight. “It was a magnificent evening with calm air and clear skies; and it became even more obvious that drilling near these ancient, spiritual and archaeological gems will need to be carefully managed and requires a substantial comprehensive plan moving forward,” Gordon concluded. A picture tells a thousand words, and Eco Flight’s night images reveal light pollution from flaring. During my visit, these flare had yet to wash out a night sky chalky with star glimmer. Sleeping under the stars in this mystical place offered a cosmic epiphany of a rare and fading variety, a connection to deep space from an ancestral center of the desert southwest. Such inky darkness and historic value is found in only a few remote places today. Eco Flight’s daytime images show what Gordon calls a “web of roads” leading in all directions and marring mesas that have known few other tracks than those of the Chacoans. Even as gas prices plummet due to a glut of American oil, the push for drilling knows no bounds. You see it in low fuel prices on the marquees of gas stations, and you feel it with intrusions of 21st century energy development writ large on the austere canvas of New Mexico. The great houses of Chaco Canyon are reminders that the ancients were anything but primitive in their construction of a lasting and awesome legacy. 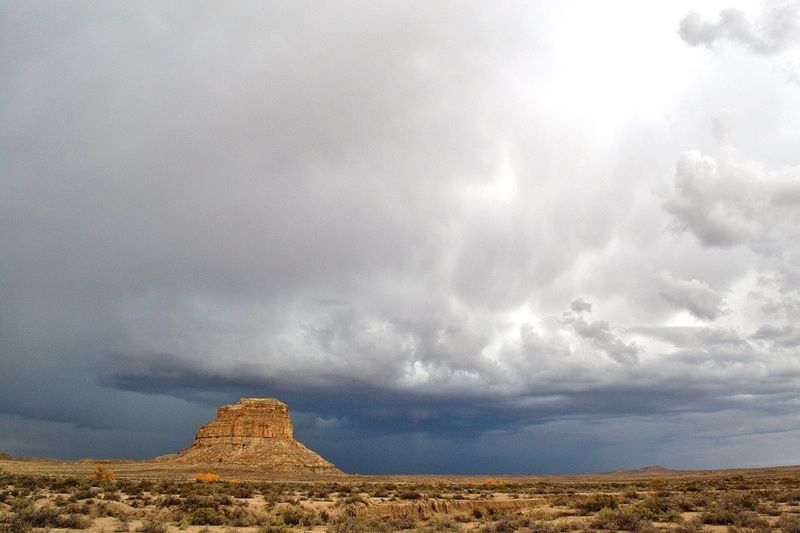 The New Mexico Wilderness Alliance reports that only public pressure stands between road building for disruptive drilling and Chaco’s setting in a sanctuary-like park. “Oil and gas drilling on state lands within view of the Park’s Visitor Center continues to be a significant threat,” reports the alliance on its webpage. The alliance states that widespread publicity pressured Cimarex Energy to delay any immediate plans for developing leases visible from the Park’s Visitor Center. Chaco Canyon is a site worthy of protection for its archeological treasures. This is an issue that is not flying beneath the radar of regional conservationists. 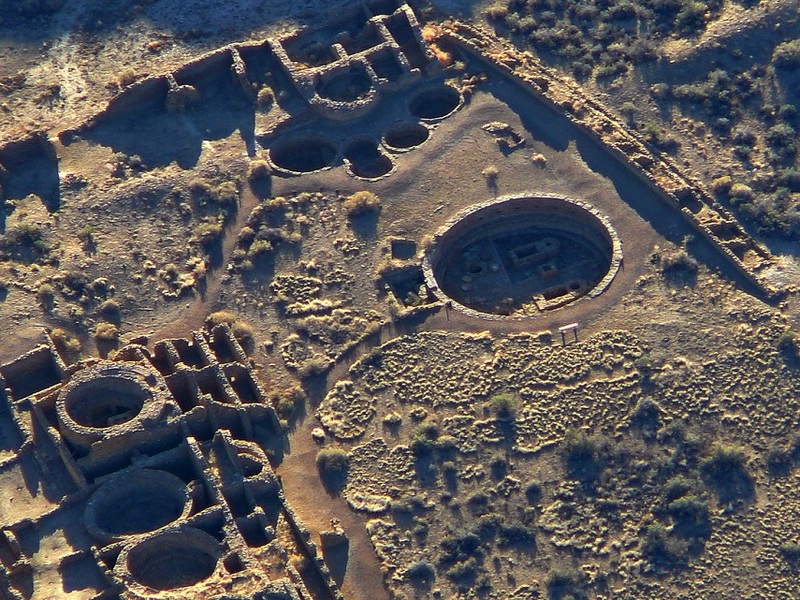 This aerial view of a Chacoan great house reveals the immensity of these stone age buildings.